Won’t the real Banners please stand up! 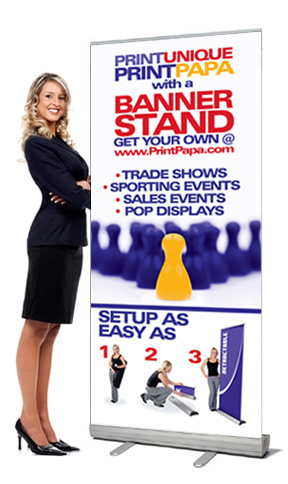 Everyone knows that Banner Stands are an industry workhorse when it comes to Trade Shows and conventions, but what most people don’t think about are other very practical applications. For instance, a well placed Banner Stand tower 80 inches about your typical run of the mill A-Frame sign is more likely to be seen by passers by. You can have much larger images, more information and make a huge statement! What about a restaurant, placing an entire menu on a banner stand, or special promotions. Grand opening signs for your store front, now hiring, holiday sale, the possibilities are endless. Let’s not forget the obvious uses and how effective they can be at Trade Shows, but why just have one. Why not get a few and make a real spectacle of your booth? 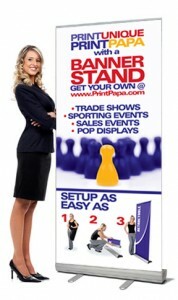 3 banner stands creating one large promotional image is a great way to catch the peoples eye! 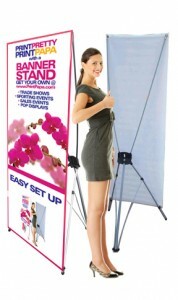 There are a ton of useful ways you can use a Banner Stand and the nice part is, once you buy the hardware, you can just buy new banners and keep the marketing train going. This entry was posted in Marketing on May 8, 2013 by Nick Dillard.